Pasta Roses is a unique pasta dish from the Emilia-Romagna region of Italy. Known as Rosette di Pasta alla Romagnola (or alla Emiliana) they are most commonly found around Modena. The original recipes that I found for pasta roses used ham and fontina cheese. In this recipe I decided to try prosciutto and asiago cheese and really enjoyed that flavor combination. 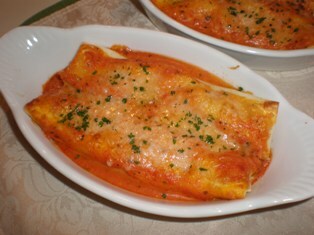 You could also make pasta roses a vegetarian dish by using thin, blanched slices of zucchini and cheese for the filling. Fresh pasta is best for this recipe but you can use dry lasagna pasta if you prefer. Try to find flat lasagna strips without the curly edges. 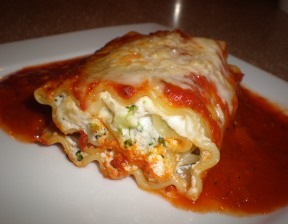 If you use curly-edges lasagna, cook it first and then use a knife or pizza cutter to trim off the edges. shower, anniversary, or any other special occasion. 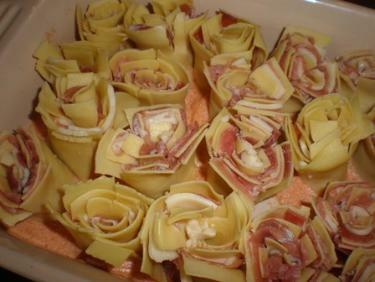 The pasta roses may be assembled ahead of time and refrigerated. Remove them from the refrigerator about 1 hour before you plan on baking them. The pasta should be at room temperature before you put it in the oven. Put butter and cream in a small saucepan over medium heat. Bring the mixture to a simmer and reduce the sauce a bit, about 2-3 minutes. Add the tomato paste and the nutmeg; stir to incorporate. Continue cooking the sauce until it is the consistency of buttermilk, about 2 minutes. Spread half of the sauce in a shallow baking dish that is about 8 x 10-inches. Set the remainder of the sauce aside. On each pasta strip, place a slice of prosciutto. Cut the prosciutto to fit; it should not overlap the edges of the pasta. Sprinkle each strip with some of the shredded Asiago cheese. Roll up the pasta like a jelly roll, starting from the short side of the strip. Cut the strips into 2 or 3 pieces that are about 2-inches high. With a paring knife make an X cut about 1/2-inch deep into one side of each piece. These cuts will help the roses "bloom." Preheat the oven to 450. Put the roses in the baking dish with the cross cuts face up. Press down a bit on the roses to help them open slightly. Use a pastry brush to brush the remaining sauce over the roses. Sprinkle with Parmesan cheese. Bake for about 15 minutes, or until a light brown crust forms on top. Remove from the oven; let rest for 5 minutes before serving. Place 2 or 3 pasta roses on individual serving plates. Tuck in a few basil leaves as a garnish. 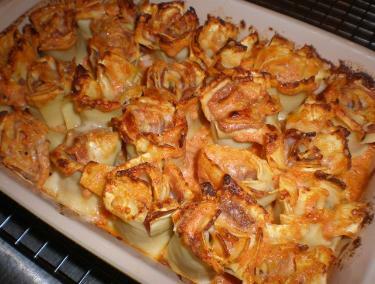 Pasta Roses arranged in a shallow baking dish ready to be brushed with sauce and baked. 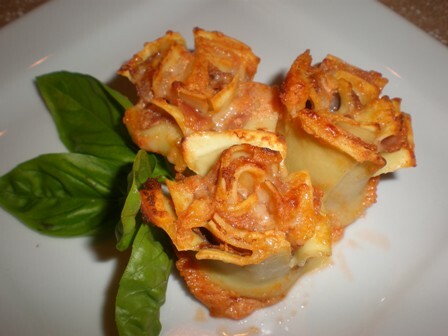 Pasta Roses baked and ready to be placed on individual serving plates. This flour makes all the difference in the world when it comes to making fresh pasta. The dough is silky smooth, easy to stretch, and tastes great. If your pasta using typical American all-purpose flour is always a little disappointing, you should try this flour. The advantages of fresh pasta are many; it is rich in flavor, lighter in density, and gives you flexibility in making different shapes and cuts. Whether you're rolling out sheets of lasagna or slicing strands of fettuccine, this classic, hand cranked pasta machine is up to the task, Mercato's Atlas 150 offers nine thickness settings and can tackle all types of dough.